In Orlando, Florida, many stand waiting, hoping for some reprieve. 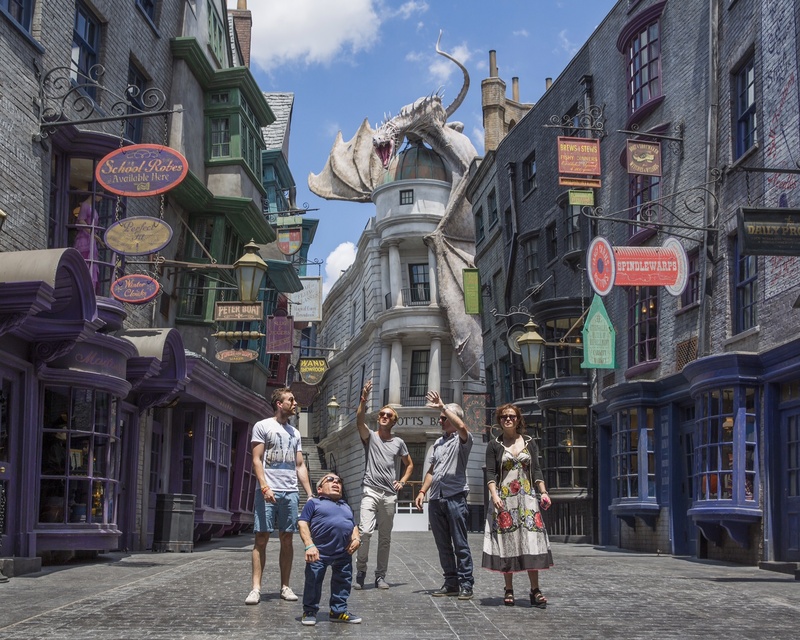 Wednesday was the second opening day for the new Diagon Alley section of Universal Orlando's Wizarding World of Harry Potter, and attendees have been waiting in line for its most heralded attraction, the ride Harry Potter and the Escape from Gringotts, for upwards of seven hours in 93 degree-plus heat. Is it crazy? A little. But the people in line have certainly had to weather all kind of horrors... terrible body odor, uncomfortable standing, unbearable heat. And it's not pretty. Here's (my imagined) harrowing account of the wait of one park visitor, who wishes to remain anonymous. Let's just say, it was a little less than magical. I'm here with my family to see the Wizarding World of Harry Potter, and I can't wait to get on the new Gringotts ride! We all read the books and watched the movies together, so this should be pretty exciting. We've been waiting for almost an hour now, which is pretty long, but it is the second opening day and it should be worth the wait. Wish I had a broom to fly over this line, though! That was a Harry Potter joke, get it? Supplies are starting to run low. My mom brought water and granola bars, but it isn't enough. My little sister is starting to cry from hunger. I've heard people say that the wait for this ride is five hours, but that doesn't seem realistic. After all, it's been almost two hours, we have to be getting close. It's been three hours and I still can't even see the entrance to the ride. My sister is looking weak, so my dad has devised a plan to get out of line, go to the Three Broomsticks to pick up a Butterbeer and some fish and chips, and sneak back in. It's risky, but it should work. We've made it this far, right? Someone tripped my dad while he was trying to get back in line. He was almost back to our place in the queue when someone threw a wand from Ollivander's right in his path. People are ruthless. Must be the lack of soft-serve. Some medics took Dad away, but we couldn't see how badly he was hurt. I hope he's okay, we're all so worried. But we've been waiting so long we can't step out of line now. If there is a merciful and just God, he will let us onto this ride. Oh, and He'll make sure that Dad's okay, too. My sister is looking sick, so we've been scoping out the crowd for food, but it seems like everyone is out. The family I've been eyeing with the matching Mickey Mouse shirts have eaten all their purchases from Honeyduke's. The ride worker who came out and said it'll "just be one more hour" got figuratively murdered with the daggers of a thousand eyeballs. The smell of mutiny is in the air. My sister got sick and started vomiting, so my mother had to take her to the bathroom. Before she left, she looked into my eyes and said "Make it to the ride, darling. Make me proud." So I must go on. My feet are killing me, so I've started taking naps on the ground, waking up every 15 minutes to make sure the line hasn't moved. I've begun talking to myself to stave off boredom, making up Harry Potter fanfiction from the perspective of Filch the janitor's cat. It's pretty good. If I ever get out of here, I think I can get it published. I'm so alone now. I've been abandoned by my family and by God. Life no longer holds any meaning. I wonder if I'll ever leave this line. I wonder if I'll just stay here forever, haunted in this shiny theme park world of false magic by dreams of the family I once had. I wonder... hey, if that the front of the line? Single rider, over here! OH MY GOD I'M GOING TO GRINGOTTS!